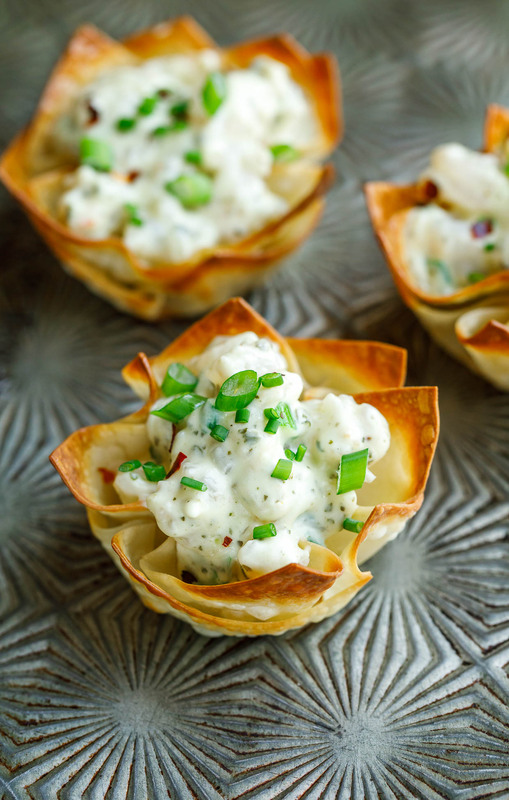 Creamy Pesto Shrimp Wonton Cups make an easy yet impressive appetizers for parties and gatherings! Confession: I’ve been making these creamy pesto shrimp wonton cups since the early days of the blog (circa 2009) and somehow never blogged the recipe. 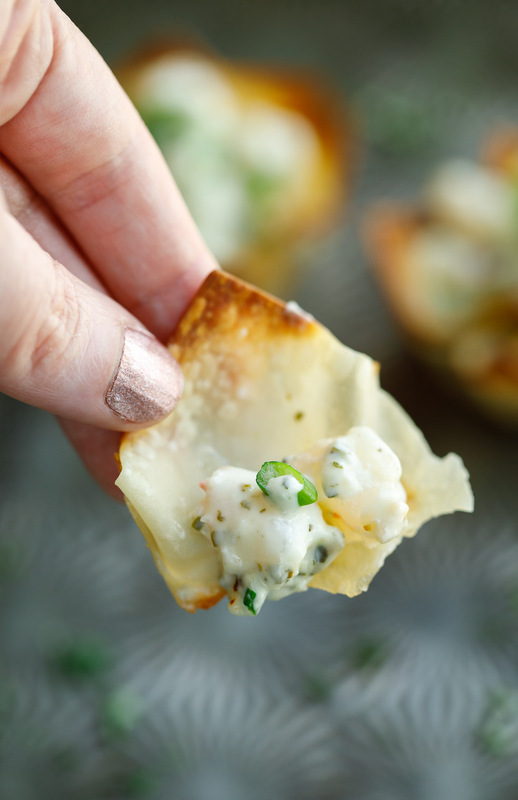 These past few weeks I’ve been re-shooting all my crispity crunchy baked won-ton recipes and finally got my act together with these pesto flecked bites. Gah! They’re so good! 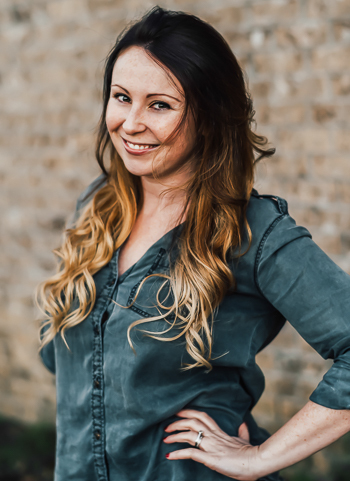 There are still a few that still need new photos and I’m pretty excited to have an excuse to eat my way through this tasty list again! I even have a few new won-ton cup recipes coming atcha real soon so stay tuned! There would be more in the photos but… we ate them all. EEK! Can you blame me? Hot from the oven these bad boys were just BEGGING to be devoured! I’m a huge fan forgoing the traditional pan-fried or deep fried wonton technique and baking them in the oven instead. They’re not only easier to assemble, but also much speedier to throw together since the fried variety would need to be pinched and sealed into little ravioli-esque won-ton triangles or little crab rangoon style dumplings. Besides, the faster I can make these, the quicker I can shovel them into my face. These creamy pesto shrimp wonton cups are loaded with fresh garlicky shrimp and blanketed in the most luscious pesto cream cheese sauce. I’m completely bonkers over these flavors together and cannot for the life of me eat just one of these easy cheesy shrimp bites. Make a few to share with your significant other (Netflix and apps FTW!) or make extra to snack on at your next party! These bad boys are great for the holidays or simply to jazz up date night at home. The recipe below makes 9 tasty shrimp wonton cups but feel free to double, triple, or quadruple the recipe as needed! 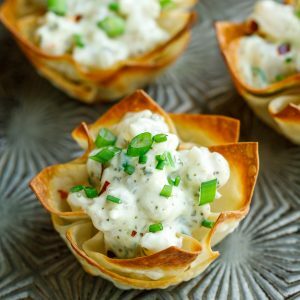 Creamy Pesto Shrimp Wonton Cups make an easy yet impressive appetizers for parties and gatherings! The recipe makes 9 tasty shrimp wonton cups but feel free to double, triple, or quadruple the recipe as needed! If using frozen shrimp, defrost. If using tail-on or shell-on, remove both to prep the shrimp. Set aside. Pre-heat oven to 365 degrees F.
Spritz or rub a standard muffin tray with oil. (I like to use a natural avocado oil spray) and line each cup with two won-ton wrappers. After adding the first won-ton wrapper, place the second one on top so that the pointed corners do not cover each other and instead resemble a little sun pattern. For extra crunch you can also lightly spray the won-ton wrappers themselves with a little oil. Bake for 7-8 minutes until crispy. In a pan heated to medium-high heat with 1-2 tsp oil or butter, add your shrimp and sauté until almost fully opaque and cooked through, then add your garlic and sauté an additional 30-60 seconds until fragrant and tender. Transfer mixture to a cutting boards and chop into small pieces. Add cream cheese to a medium bowl and warm for 30 seconds in the microwave to soften, then add your shrimp, pesto, green onion, salt, and pepper. Mix well then spoon into crispy baked wonton cups. I like to serve them up right away but if you need to wait to serve, they can be placed back in the oven for a few minutes to warm them up before eating. Garnish with additional green onion or chives and optional red pepper flakes for a bit of a zing. Enjoy! You're welcome to use medium or even small shrimp if you'd like - any size can easily be tucked into these creamy pesto wonton cups. Simply add more to make up for the size difference and you're good to go! 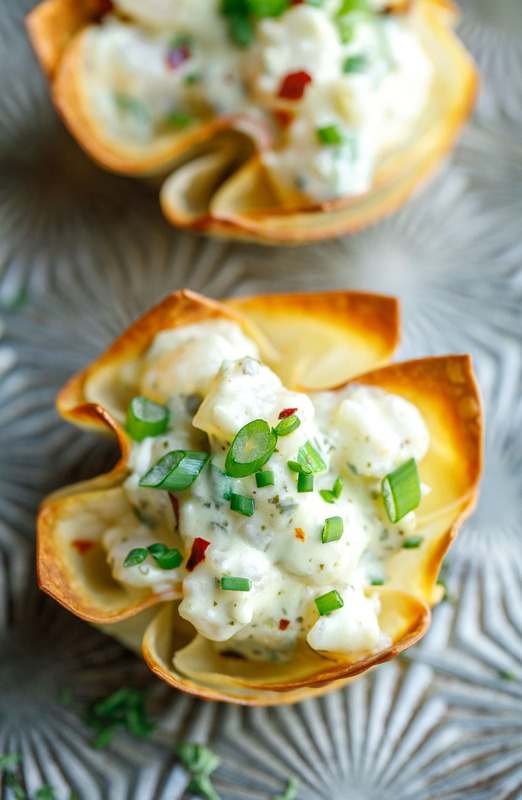 If you get a chance to try these crazy delicious Creamy Pesto Shrimp Wonton Cups, let me know! Leave some love in the comment form below or tag your photos with @peasandcrayons on Instagram so I can happy dance over your creation. All that’s left to do is grab a wonton cup and chow down! These are just delicious little party bites!!! I love using wonton wrappers to make little cups. I think I’d have to quadruple the recipe it sounds sooo good! I love fixing bit-sized hors d’oeuvres for parties and these look perfect. You get all the shrimp and cheese sauce and none of the mess. I can’t wait to try them!